Congratulations Greg! You are definitely a superhero! Greg is a REAL leader, but not because he’s six feet tall with a very serious facial expression most of the time but because he works at it every single day. He has a mindset for growth and is constantly trying to learn how to help others to lead, how to communicate better and how to influence people to bring out the best in them. More truth be told, Greg is one of the kindest, hard working and most interesting people you will ever meet. Dedicated to his goals, his family, his health and to his friends, Greg is the kind of man that will be there when you need him. When Mo-Mentum needed to get our mats hung on the wall, Greg offered to help. When we needed our Hex bars hung up on the wall, Greg offered to help. If lose your keys, Greg will be the guy scouring the floor with you. Greg shows up to his workouts and he’s always all in, whether he’s working on building strength or stretching and relaxing his mind in yoga. He understands that as long as he maintains his health all things are possible. If you need inspiration, watch Greg Laboda. He walks his talk, leads with his mind and heart and lives extraordinary! 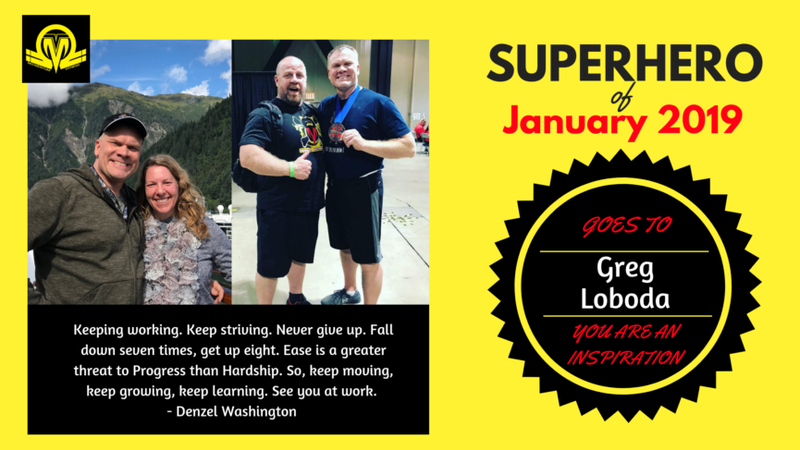 Meet Greg, Mo-Mentum Fitness’s Superhero of January 2019! He definitely is a superhero!